It was reported today that Pope Francis curbed the use of the ecclesiastical title of monsignor. Some priests I know will be mad and some will go on antidepressants. The papal directive is that the monsignor title will be not available for those under 65 and that when it is bestowed, it be the title of “Chaplain to His Holiness”; the other two titles are shelved (i.e., Prelate of Honor and Prothonatary Apostolic). Gerard O’Connell’s article in Vatican Insider is here. In the archdiocese where I live there are few monsignori: for the last 30 plus years the archbishops have rarely bestowed the title on priests, though very few have it. In neighboring dioceses like Bridgeport and New York priests crave the honor and too many feel they are entitled to it. Sadly, too many of those who have received the title of monsignor are sycophants and many unseemly characters who are less loyal to Jesus Christ and the sacrament of the Church than to his bishop. A bishop no longer in Connecticut used the title to reward those who he were behind him in all things–those who never questioned his authority; the criteria to judge a man’s worthiness was understood to be subjective. In fact, and in my opinion, for a good many priests the discernment of service was too connected with preferment. The call to genuinely serve all people for ever really was sclerotic. Some monsignors would state that being a priest was difficult enough today and that they deserved a little bone now-and-again. The regular ministry of salvation of souls, spiritual and corporal works of mercy, preaching and the administration of sacraments was not enough, not meaningful enough. Catholics are often happy with their parish priest’s genuine and holy “accomplishments” for the Church; they enjoyed the bishop’s recognition. But laboring in the Lord’s vineyard, no matter how long and how hard, does not warrant such reward. Some are arguing that doing away with outward ecclesiastical signs is a kind of iconoclasm. I doubt it. In fact, what the pope did is not iconoclasm by definition. Ecclesiastical titles neither create nor diminish careerism in the church, necessarily. The careerist attitude is born of another reality based on sin and not discipleship and apostleship. It is true we all like some measure of respect and acceptance for the bishop and society. Human nature will foster other ways for reward. We already of the mentality of the ‘better’ parish, the influential diocesan job, or a softer ministry, or “doing your own thing.”. Humanity can skirt the monsignor title with titles like “executive committee, ” the “Special Advisor to the Bishop” and “Senior Priest.” I am sure some bishop or clever canonist will devise something to reward the worthy. Is this move no the part of the Holy Father a jab at tradition? Perhaps, but I would not want to place that criticism on him. It seems to be true that “Pope Francis going back to older traditions” and that is what I think is key for us. An older tradition is sometimes best especially if there it is perceived to be less inclined to immature and sinful behavior. But I would look it this way: Pope Francis comes from a religious order that does not accept the mentality of preferment. The Society of Jesus has always been against, and rightly so, the notion of serving the Lord with the idea of reward in mind and heart. Following under the standard of the cross has a very deep meaning that I think is operative in Francis as the bishop of Rome. I also promise that I will never strive for or ambition any prelacy or dignity outside the Society; and I will to the best of my ability never consent to my election unless I am forced to do so by obedience to him who can order me under penalty of sin. And moreover, if I shall find out that anyone [another Jesuit] is seeking to secure anything of the two aforementioned things or is ambitioning them, I promise that I will communicate his name and the entire matter to the Society or its Superior. Many in the world are watching the Church and how she is addressing the needs of a contemporary Church. The concerns of the College of Cardinals at the last papal election reflected the concerns of the faithful. With a good sense there a new things happening. One such innovation is Francis creating the Council of Cardinals to advise him on the administration of the Church. This work is being shared. Another innovation was announced today: a special commission will be set up to have oversight on matters pertaining to the protection of children and the pastoral care the victims. Clearly, this move of the Pope is a continuation of the good work of Pope Benedict regarding the sin and crime of sexual abuse. I pray that the commission will act decisively and with mercy and justice. The meetings will conclude tomorrow afternoon [Friday], completing the review of the different Congregations of the Roman Curia initiated during these recent days. 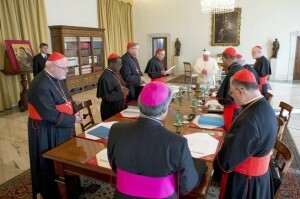 The next round of meetings is scheduled for the 17, 18 and 19 February, preceding the Consistory of the College of Cardinals due to take place on the 20 and 21 of the same month, and the Consistory for the Creation of new cardinals on 22 February, Feast of the Chair of St. Peter, and the solemn Concelebration of Sunday 23. In addition, the meeting of the Secretariat of the Synod of Bishops is scheduled to take place in the days immediately after (24-25 February). 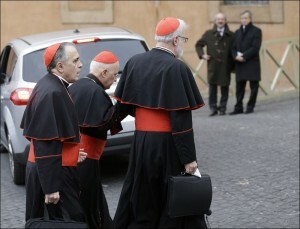 The Pope and the Council of Cardinals begin their second meeting today, and running until Thursday. His Holiness established the agenda to study the need for substantial reform of the Roman Curia, to consider other proposals for change, and to advise the Pope on general matters of Church governance. Several changes have been already announced. Various Congregations will be visiting with the Council. The next scheduled meeting of the Council will happen on 17-18 February, the eve of the Pope’s first consistory for the creation of new cardinals, set for 22 February. The Consistory will give the Pope the opportunity to meet with the College of Cardinals since his last meeting with him following his election to the See of Peter. Vatican Radio and the French news agency I-Media broke the news today that the Bishop of Rome, Pope Francis, will create new cardinals in a Consistory to be held February 21 and 22, 2014. No names have been mentioned and there won’t be names likely until February. At the same time, Pope Francis is holding a meeting with all cardinals in Rome to discuss possible reforms. By February 2014, there will b 14 vacancies of 120 that are noted in Canon Law. By March, there would be 16. The 120 limit is an arbitrary number established by Pope Paul VI. Possible cardinals to serve in the Roman Curia: Archbishop Pietro Parolin, the new Secretary of State, Archbishop Gerhard Ludwig Müller, the Prefect of the Congregation for the Doctrine of the Faith, and Archbishop Beniamino Stella, the Prefect of the Congregation for the Clergy. There could be more if Pope Francis makes more changes in his curia. 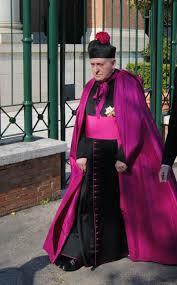 Plus, there are residential archbishops around the world. I would not expect new cardinals in the USA. I don’t follow the organization “We are Church” but I am guessing it is a public lobby that is loosely Catholic and focussed on the misdeeds of Catholic Clergy. I don’t subscribe to lobby groups; and, I don’t think these groups are but a very thin veil leading the faithful to dissent. But, it seems that Mr Weisner is correct; but I don’t think for the same reasons as Weisner thinks. The agenda of Weisner and We are Church is not too coherent with Church teaching and tradition. Weisner speaks of the culture wars faithful Catholics have to face. But I have to wonder if this controversy is really born in the fact that there is a divide between orthodox and unorthodox Catholics and that some of the teachings of Tebartz-van Elst contradicted those of past bishops? It is entirely possible some members of the Church in the Limburg Diocese are pushing some of these things in way to be anti-Benedict XVI. 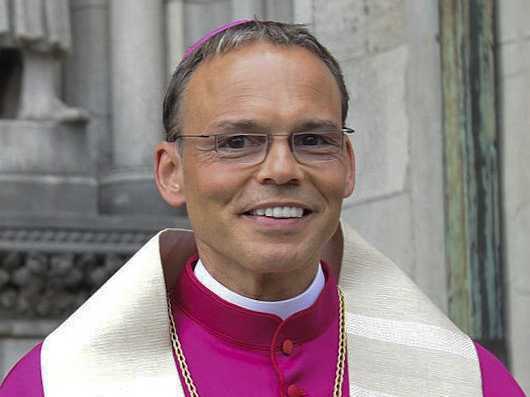 What can said of the Limburg bishop is possible for all of us. No one is exempt from mistakes. AND yet we ought not be self-righteous to think that this matter pertains to other people. I am not gloating over the imprudence of Bishop Tebartz-van Elst. Demonizing the bishop is unbecoming of Christians. Mercy is what is required here as we are taught today by Pope Francis. We always forgive our brother. This begs us to ask what is the responsibility of a bishop of the Catholic Church. The responsibility of the bishop is the discernment of what we are saying about God, about our Christian life, about our sanctification, our conversion, about the encounter with the person of Jesus Christ. Christianity is not about social conformity, it is not about social acceptability. The bishop’s responsibility, hence, is to lead the faithful to perfect communion with the Holy Trinity through good witness. As a friend once said, we go to a baker because we want an appetizing, something delicious. We know that baked goods are not to be poisonous, they are to be delicious, and they are to have a particular deliciousness. Applied to the vocation of a bishop, we would say the vocation of the “profession” determines the responsibility: a bishop’s responsibility is stir our awareness and desires for God. We want to be with God. How we understand what happened is crucial. The other day Pope Francis exercised his pastoral authority in determining that the Church universal needs a clear judgement on the activities of the Limburg bishop. Pope Francis gave a temporary dispensation from the bishop’s obligation of residence (Cf. Canon Law, 395). Moreover, His Holiness appointed a new vicar general for the good the faithful who will act in the place of the bishop who will be living outside his diocese until Providence provides otherwise. The hope is that this decision will allow for time for the commission to collect and evaluate the data plus it will allow contention to diminish a bit. Let it be said that the bishop is not suspended as the secular and some Catholic media outlets have reported. In cases like the Limburg case, the bishop is often asked to resign voluntarily or to take a leave. No actual decree of suspension was drawn up. By the Pope’s wisdom the bishop has a leave of absence. There is a difference. A person who abuses an ecclesiastical power or function is to be punished according to the gravity of the act or omission, not excluding privation of office, unless a law or precept has already established the penalty for this abuse. The bishop of the Roman Church, in whom continues the office given by the Lord uniquely to Peter, the first of the Apostles, and to be transmitted to his successors, is the head of the college of bishops, the Vicar of Christ, and pastor of the universal Church on earth. By virtue of his office he possesses supreme, full, immediate, and universal ordinary in the Church, which he is always able to exercise freely (canon 331). Catholics know deeply that the Church founded by Christ is NOT a democracy, she is not a dictatorship, the Church does not work from a gesture of sentimental, nor is she the Inquisition. The Church is a sacrament given to us by the Lord. The Church is a guided companionship. She discloses a person, a Divine Person, that is, our Lord and Savior. What’s at stake is the relational nature of all this? As Pope Francis said to Eugenio Scalfari, “Truth according to the Christian faith, is the love of God for us in Jesus Christ. Therefore, truth is relationship.” We know this to mean that “all this [talk of relationship with Christ] throws me wide open to expecting the Mystery will show Himself….” Jesus entered history to educate us something new. That something new is ourselves as a new creation. Any lack herein of a true relationship with Truth will set us back. And, this may have happened in Limburg: the lack of memory of the Lord. Having said this, what does Limburg indicate? A multi-million euro building project with a $20,000 bathtub and $482,000 walk-in closets is over-the-top. But Limburg’s bishop is not alone in mis-using money; we have a track record of bishops leaving a diocese in debt by millions of dollars. A good example in the USA is a former bishop of Bridgeport (now he’s administering another diocese) and several other bishops and priests who live in ways wholly inconsistent with their office and responsibility. Bishops now long dead were financially irresponsible with other people’s money leaving their successors to pay off the debt. One can think of good examples in the bishops of Boston and New York. In more recent years bishops like those of Boston, Philadelphia, Pittsburgh to name a few, have all given up grand homes and luxury items favor of more modest living. The Church, in her wisdom, has taught and asked priests to live simply, even frugally. This is not new news. Just read the Fathers of the Church and the Magisterium on priestly life. Mother Church in her good example has taught that beauty and well-made items reflect the truth of the Incarnation and the dignity of the craftsman; being cheap and stingy are not virtues nor ought they be made such. We are required to be generous to others but not to the point of excess. Beautiful art, vesture, music, words, buildings all communicate the Divine Majesty. Poor and wealth people need beauty. History tells us this fact. Beauty reveals truth. We ought to recall and confront the argument given by secular priests that they don’t have a vow of poverty as the religious profess. While technically true, simplicity is an objective truth and manner of living that helps all people to conform themselves to Christ crucified and risen. Diocesan priests ought to remember this is clear and consistent teaching of the popes. Lots of people interpret Pope Francis to say that the Church has to be poor but I think interpreting Francis strictly in terms of finances is superficial. Surely he does mean that we need to be mindful of how use money for ministerial purposes and not self promotion; a Church that is poor is one that is dependent spiritually and affectively (and even materially) on Jesus Christ who gives all things for the good. Clergymen who live luxuriously are unseemly, even giving scandal, to those who are weak of faith, to Church benefactors who their resources for the Church’s good works of mercy, education and charity. This is not only a matter concerning the Church in Germany but the Church in every place and time. Germany is in the spotlight because too many of the prelates there drive high end cars like Archbishop Robert Zollitsch who has a BMW 740d. “To me that car is not a status symbol; it is the office I use when I am traveling,” Zollitsch said at a press conference. What Zollitsch is doing is defending the indefensible. We need to learn from this case; we need to pray for our own conversion because this is not only a matter for Bishop Tebartz-van Elst or Archbishop Zollitsch but for all of us. Being self-righteous about this matter is unhelpful and not Christian. What and how they live ought to be a point for our own conformity to the cross. The entire Christian Church is called to live simply for the sake of the Kingdom.